Persistence Market Research has revealed various facts on the global immune health supplements market in a recently published research report titled “Immune Health Supplements Market: Global Industry Analysis (2012–2016) & Forecast (2017–2025).” This research report is filled with incisive insights and vital acumen on various factors that have contributed to the growth of the global market for immune health supplements. 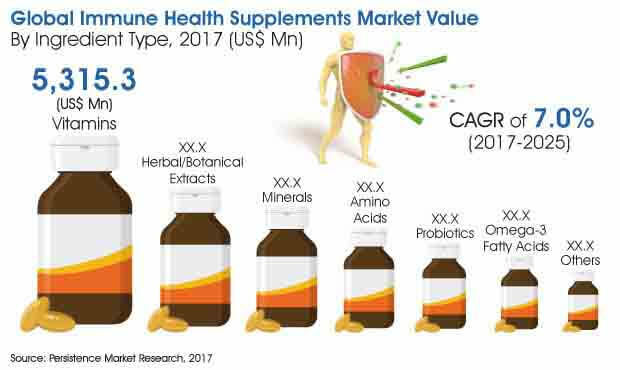 Along with the past market scenario, a glimpse of the future of the global immune health supplements market is also portrayed, which reflects value and volume projections. The forecast analysis is for five years from 2017 to 2025. This can assist the reader in slating important strategies based on present market conditions to achieve expansion in the coming future. The research study on the global immune health supplements market puts forth a global 3600 perspective. Main geographies across the entire globe are assessed and the trends, developments, opportunities, drivers and challenges in each region and sub region that have an influence over the growth of the market in the respective region are studied to get a clear picture of the global immune health supplements market. Revenue pockets can be identified with such kind of intense market intelligence that is unbiased in nature and purely market centric thus portraying a global perspective in front of the reader. Persistence Market Research follows a one of a kind research methodology to glean vital and relevant market insights. This research process ensures delivery of statistical data without errors, thus maximizing the accuracy of the research report. Secondary research in combination with primary research gives a clear market understanding based on which key players, market observers and opinion leaders are interviewed to check the reliability of the data and to add other facets of the market. The uniqueness of this research process is the revalidation and re-evaluation of the data that takes place at each step during each interview and is continued till the conclusion of the market research. Based on this vital acumen, key analysis is drawn and recommendations from domain experts are also included in this intelligence report. The multiple cross checking of the data ensures a highly accurate market scenario that can be directly used by the reader to chalk informed decisions. The research report on the global immune health supplements market includes an in-depth analysis on each segment of the entire market. The market segmentation covers ingredient type, source, form type, sales channel, and region. The research report on the global immune health supplements market covers analysis on top companies participating in this market. Various aspects such as SWOT analysis, key developments, innovations, product portfolio, financials and company overview are included in the report. The reader can gain intelligence on the major players who have a good hold in the market, based on which new strategies can be devised to gain an edge on the competition. The weighted market analysis on the global immune health supplements market delivers value to the reader by providing pertinent insights, ready to use statistical analysis and recommendations without bias in order to plan future expansion strategies and also to gain stability in the changing dynamics of the global market. The global immune health supplements market is expected to witness substantial growth during the forecast period. Market growth is primarily driven by an increase in consumer awareness regarding various health issues, along with the increasing popularity of health and wellness. The immune health supplements market is expected to witness significant revenue growth over the forecast period, owing to the increasing consumer awareness about the benefits of dietary supplements, along with a rise in the population of baby boomers. The market is expected to be valued at more than US$ 14 Bn in the year 2017, while by the end of 2025, the global market for immune health supplements is likely to exceed a valuation of US$ 25 Bn, expanding at a CAGR of 7.0% during the projected period of eight years. Among the ingredient types, the vitamins segment is expected to register a healthy CAGR of 6.7% during the forecast period, and is expected to be the most attractive segment in the global immune health supplements market over the forecast period. This segment is expected to account for a value share of more than 35% in 2017. The segment is estimated to be valued at more than US$ 5,000 Mn by 2017 end and is expected to reach a value of more than US$ 8,900 Mn by the end of 2025, creating an absolute $ opportunity of close to US$ 370 Mn in 2017 over 2016, and an incremental $ opportunity of nearly US$ 3,600 Mn between 2017 and 2025. Due to the lack of immunity, the human body attracts several diseases. This is the reason why senior citizens are more prone to chronic diseases, loss of appetite and weakening of the immune system of the body. Such diseases require supplements enriched with additional dietary supplements that are popular mostly among all ages of the population. This has resulted in a surge in the development of the global market for immune health supplements throughout the study period. Increasing lifestyle diseases and growing immune health concerns among baby boomers are some of the factors expected to boost the growth of the global immune health supplements market across the globe. The baby boomer population across the globe is growing at a faster rate, leading to rising health concerns. To deal with this problem, manufacturers across the world are in the process of developing innovative health supplements that are available in the form of liquid and powder on a large scale in order to strengthen the immune system of people. This particular population segment is likely to drive the immune health supplements market in the years to come. Healthcare costs have doubled in the past few years owing to the rising expenditure on R&D activities conducted by major players in the healthcare industry. Increasing healthcare costs is influencing consumers to choose immune health supplements, as these provide health benefits such as strengthening of the immune system, protection from cold and flu, prevention of migraine headaches, prevention of arthritis, rheumatic diseases, allergies, cardiovascular diseases, and cognitive diseases, and also lowering cholesterol.